Magic Fish Dreaming is a magical collection of seventeen poems, bursting with the joy, curiosity and wonder of children as they explore the Australian landscape of Far North Queensland. June Perkins' evocative verse and Helene Magisson's heart-warming illustrations offer new delights on every page. Such gems as 'Gecko's Dance', 'Storm Dancers', and 'Giggle Poems' invite young readers and listeners to laugh and move to the rhythmic verse, while contemplative, soulful pieces such as 'Secret Spot' and 'Magic Fish Dreaming' celebrate the beauty and serenity of the Australian bush. Themes of environmental pests and the destructive power of nature interweave with many of the poems, such as 'Rain Song', 'Cassowary Chat' and 'Pond Pests', teaching children to respect and care for the land and creatures around them. Each poem is surrounded by illustrations in warm, gentle colours, presented on expansive double-page spreads. Helene Magisson depicts the interaction of children with the natural world, and each other, with empathy, delicacy and humour. 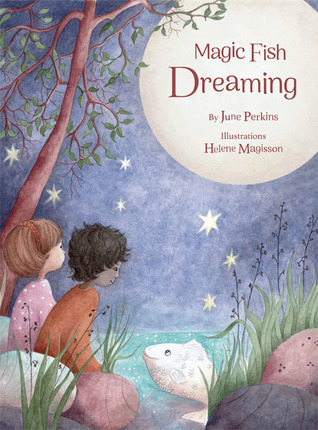 Magic Fish Dreaming is truly a book to bring joy to the heart of every child and young-at-heart reader. A collection to be enjoyed and revisited in the classroom, at bedtime, on a bushwalk or lying under the twinkling stars. Sign into Goodreads to see if any of your friends have read Magic Fish Dreaming.